As the political tide in Jefferson County has switched from blue to red over the past eight years, local candidates are starting to take notice. Candidates that would have (and in some cases, previously have) filed as Democrats are now assuming the Republican mantle. This includes several sitting judges who were elected as Democrats but are running for re-election in 2018 as members of the GOP. The second page of the document is a statement by the part requesting the state party and the legislature to take steps to allow the party to control who runs under its banner. The second page is necessary because the party really has no leg to stand on in asking for Stout to be removed from the ballot. Under Missouri law, a candidate just has to show up during the filing period, say which office he/she wants to run for and for which party, and pay $50. A candidate does not need to prove that he/she is a loyal or longtime member of the party. Furthermore, voters can vote in whatever primary they want to; Missouri has open primaries. It is no surprise that the party wants to control who gets to run for office. Going back to the early days of party politics in this country, the party bosses wanted to select who they thought was the correct candidate, based on loyalty, pliability, or other criteria. But in the past 100 years, the pesky voters have taken over the right to choose what candidates win the party nomination, and sometimes they don’t choose the person that the party bosses want them to choose. The solution here is simple. During the campaign, the party bigwigs can make it widely known that they don’t think Stout is a real Republican. Make your case to the voters, let them decide. Stout probably doesn’t have much of a chance anyway, running against Dennis Gannon, husband of state representative Elaine Gannon. So why go after Stout and not former Democrats like Judge Ed Page or county prosecutor candidate Mark Bishop, both of whom have much greater chances of winning the primary? I’m really not sure what the point of this letter is. Two weeks ago, a special election was held in Missouri House district 97, which covers parts of Arnold and Fenton, including a small slice of St. Louis County. The election was necessary because Rep. John McCaherty (GOP), who was in his 4th and final term in that seat (due to term limits), resigned to focus on his run for county executive, which he has since decided to back out of. In the special election, Democrat Mike Revis defeated Republican David Linton in an upset. Revis brought in 51.5% of the vote and won with a 108-vote margin. I think the Trump comparison is not that relevant. Trump was running against Hillary Clinton. If Clinton had run as the candidate in district 97, she would have lost big there once again. Instead, the local Democratic party nominated a moderate candidate who touts his NRA membership. And using the presidential election results to suggest that the 97th district is “deeply red” is erroneous. Keep in mind that McCaherty was a firm no on right-to-work legislation, reflecting the views of the district. Rep. Kevin Engler, R-Farmington, blamed the Jefferson County loss on a weak candidate. Have you seen @EricGreitens’ numbers in District 97 both before and after his scandal(s) hit the news? I have. Killed the GOP there. It should also be noted that 14,000 people voted in this race in 2016, when McCaherty had no Democrat opponent, versus the 3,500 that voted in the special election. While the labor union troops that were reportedly out in full force in this campaign can make a big difference in a low-turnout race, I think their efforts will be insufficient come November 2018. Let me review briefly some of the stories of Tuesday’s election. The Clean-Up Crew, an association of candidates organized by local activist David Day that campaigned actively over the summer, went 1 for 5 in contested races, with Mike Reuter winning the nomination for circuit clerk, while Mark Paul lost the county executive race, Jason Jarvis and Charles Groeteke lost House races and Dan McCarthy came in third of five candidates for county council district 7. The Crew will have four candidates in November: Reuter, Jeremy Day for county clerk, Jim Muellersman for council district 5, and Debbie Dunnegan (incumbent) for county recorder. Groeteke, who lost his bid for re-election to the county council in 2012 by 4 votes (out of 2,469 cast) to George Engelbach in the primary, lost his bid for the GOP nomination for House district 112 by 8 votes (also out of 2,523 cast) to Rob Vescovo. Avery Fortenberry, who dropped out of the race (too late to get his name off the ballot) and endorsed Vescovo, got 213 votes, and 220 voters skipped over this race on their ballots. Jefferson County voted as the state as a whole did on four of the five Constitutional amendments. The only exception was Amendment 1, Right to Farm. It lost in the county 55-45, but won statewide by about 2,500 votes. Bob Boyer (GOP incumbent) will face Mike Evans (Democrat) in the race for council district 3. The Arnold regime loves the latter and can’t stand the former, so watch for them to try to influence the race somehow. I will speculate on some methods in a future post. 1,464 votes were cast on the Dem side in this race (excluding undervotes), and 1,755 were cast on the GOP side. In the establishment vs. liberty battle in the Republican party, the races for central committee seats was roughly a wash. Carol Soppeland (Rock Twsp) picked up a liberty seat, but Gerald Bollinger (Riverview Twsp) was an establishment pickup. You might call Michelle Paul in Imperial Twsp a pickup as well. Correct me if I missed some names here; other races I considered a wash. It is now time for the Paul Wieland (9,681 votes received in the primary) vs. Jeff Roorda (8,478 votes) Senate District 22 battle, which will be closely watched, to begin in earnest. The news that Arnold city councilman Jason Fulbright would be running for the GOP nomination for state representative in the 113th district (Arnold-Imperial area), and also for GOP committeeman for Arnold Township, caused a lot of people to say “Hubba-whaa?! He’s a Republican?” Let’s look at the evidence and see if Fulbright is a true believer or merely a RINO (Republican in name only). He “likes” a lot of Republicans on Facebook. Of course, this could be just campaign-season posturing. I recall checking his online accounts awhile back, and he at the time liked Mitt Romney and Fox News’ Megyn Kelly on FB and/or Twitter. He was a sponsor at the 2013 Jeffco Lincoln-Reagan day (scroll way to the bottom for his name). He seems to have a friendship/alliance of sorts with Rep. John McCaherty (R-97th). He is firmly ensconced in the Arnold regime, where Phil Amato, no friend of the GOP, appears to be his closest pal. As a regime member, he has remained silent on the two reported cases of unethical behavior by police chief Bob Shockey. He also served as a deputy treasurer for every regime candidate (MacArthur, Crisler, Plunk, and Freese) in the April election – hardly a lineup that warms GOP hearts. Upon joining the council, he voted to pay Protective and Investigative Services for the worthless investigation it did of the Boone-Moss incident. Furthermore, Fulbright’s tenure on the council was launched when city attorney Bob Sweeney illegally kicked his opponent off the ballot, leaving Fulbright unopposed. If he condones Arnold malfeasance, what kind of Nixon administration antics will he give a pass to if he’s in the Legislature? I consider cronyism like this to be a Democratic trait. Sure, Republicans do it sometimes, but look at every big city in this country – run by liberals and corrupt. His legislative focus has been on spending programs. He supports “free trash.” He sponsored a bill to buy unnecessary metal detectors for city hall. He co-sponsored another program to give grants to subdivisions for beautification (isn’t that what HOA fees are for?) Another grant he supported was for businesses to tear down buildings on their lots (the businesses should pay for that). He did vote in favor of ending the red light camera contract right before the April election, but it seemed to pain him to do so. 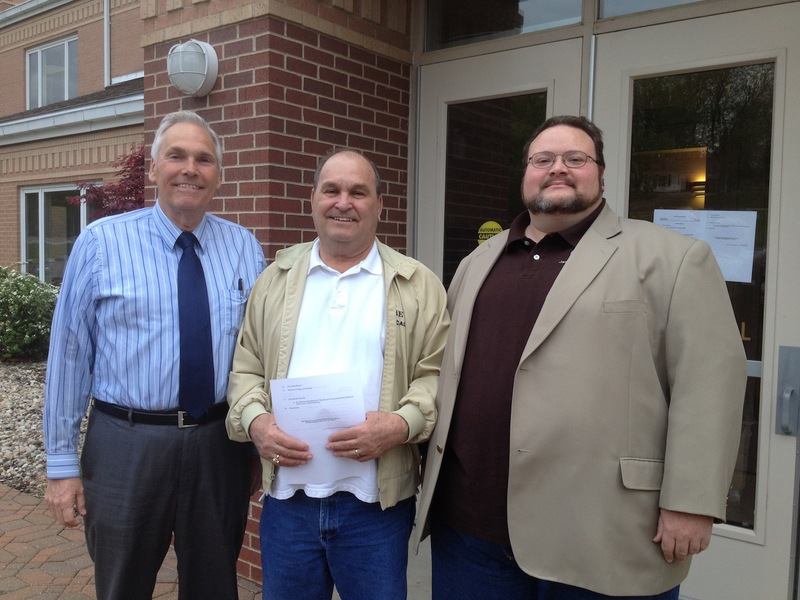 Amato, JeffCo Labor Club President Bart Velasco, and Fulbright stand united for unions. Gaye Counts, wife of Arnold Mayor Counts – $100 (Mr. Counts gave a $3,000 in-kind contribution; I don’t know what that was). So there is the evidence. Feel free to contribute what evidence you may have in the comments. On August 5, you (GOP voters in the 113th district and/or Arnold Township) can be the judge. A large number of GOP candidates for local offices gathered in De Soto yesterday for the holiday parade. 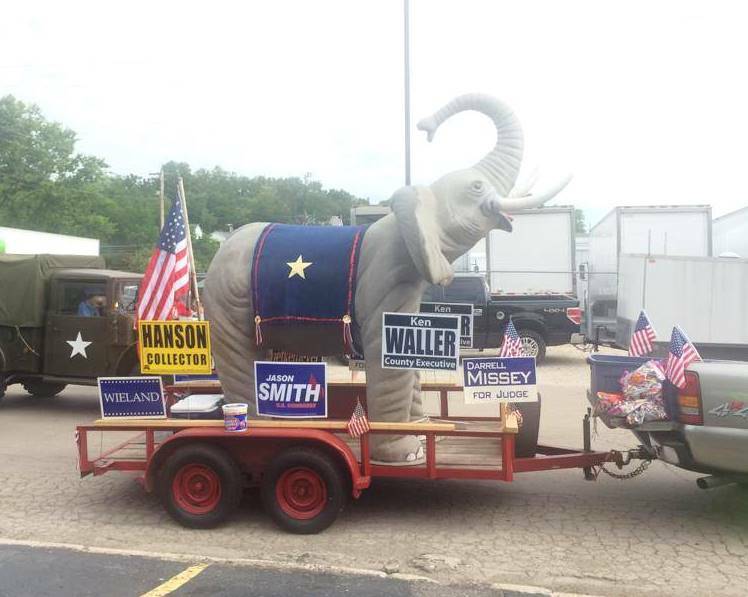 I am told that the county Republican committee had a float in the parade, festooned with campaign signs from many of the party’s candidates (along with a large elephant). However, not all GOP candidates were allowed to post their signs on this float. Mark Paul, who is challenging incumbent county executive Ken Waller, was turned away. Maybe it is understandable, but not justifiable, to reject his sign if he is taking on the titular head of the county party. But county clerk candidate Jeremy Day was also denied. He has no GOP opponent, and the incumbent is Democrat Wes Wagner. Is the county GOP endorsing Wagner? Similar shenanigans occurred in 2012, when a print ad placed by the county GOP committee left out three candidates, two of whom were active in the local Tea Party. And also in 2012, in a move that caused the central committee and several individuals (including George and Janet Engelbach) to be fined by the Missouri Ethics Commission, the committee laundered money through a front political action committee in order to send mailers supporting establishment candidates (such as the Engelbachs) against liberty-minded opponents for seats on the committee. And lets not forget the 2012 county caucus debacle. Let me know if I missed anyone. If you are interested in some change in the county GOP, consider voting for any of these candidates that are in your township at the August 5 primary. Preview your ballot here. Everything the regime running Arnold does is rooted in politics, for the furtherance of the regime. Many times, the political motivation of these moves is obvious. Put council members’ names on bills? Blatant. Credit Nancy Crisler for the ridiculous red light camera “compromise?” Transparent. Send out a city newsletter a week before the election? Come on. The regime made another such move Thursday night in electing Jason Fulbright as mayor pro-tem in a unanimous vote. Fulbright is running for the GOP nomination for state representative in District 113 and for the Arnold seat on the county GOP Central Committee (Fulbright’s Republican bona fides are highly in doubt; I will explore this in a future post). So his buddies want to help him out with that, and they think electing him to this almost entirely ceremonial post will help. This is after Fulbright lent a hand to the just-elected council members by serving as all of their deputy treasurers. Mayor pro-tem and campaign deputy treasurer, incidentally, are similar in the fact that neither really require much work and both are basically titles, lines on resumes. But if they can fool voters into thinking Fulbright deserves a seat in the legislature, then they will be useful.